To give your jewelry extra sparkle after cleaning delicate pieces, try dropping your piece in a glass with Alka Seltzer and then watch all those tiny bubbles scrub your jewelry bright. You should get some extra "sparkle" on your metal with this little trick. If you're using a needle nose plier to move or straighten out any renegade wires in one of your pieces, it really helps prevent gouges and dents if you wrap your plier tips with architectural tape first. You can also use masking tape but it's a bit stickier than thin architectural tape. Buy it at art supply stores. If you find yourself all set to prototype a new design but don't have a thick enough gauge wire, consider doubling up by using two thinner wires in its place. I do this frequently and often find that I end up preferring the use of the two thinner wires. 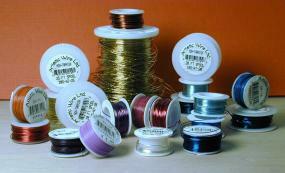 If you work consistently on your wire jewelry projects, it can be hard keeping everything organized. I am often working on at least a dozen projects simultaneously and use a method to help me stay on track: I have small and medium sized boxes for each project that I'm working on. You can use labeled shoe boxes, plastic food containers, etc. I keep any gems or beads along with other supplies for each of the individual projects in those boxes and then place them on a series of shelves for ready access.